Unpretentious, fresh, flavorful, and Vietnamese—when the food at a restaurant mirrors the style and personality of the chef-owner, you’re in for a real treat. And that’s just what you get at vegan hot-spot Vinh Loi Tofu. Located in the corner unit of a tiny shopping plaza in Reseda, Vinh Loi is an eatery, tofu factory, and specialty Asian grocery store all in one. Kevin Tran, who opened the place eight years ago with his wife, is as constant a presence as the flow of customers. Based behind the podium-sized counter Saturday night, he masterfully took phone orders, greeted regulars, delivered food to tables, and even walked outside, phone in hand, to wave down a new customer looking for the place. It certainly feels that way when you walk into the brightly lit, small-but-welcoming space. Walls are painted a warm mustard and accented by the ubiquitous red paper lanterns seen in most Asian restaurants. A dozen two-person tables, some pushed together to accommodate larger groups, fill a square space in the front of the unit while the back houses the kitchen and grocery store. Customers spill into narrow aisles, politely maneuvering their way toward refrigerators filled with take-away mock meats, fresh coconut, kombucha, and homemade soy milk. Everyone is visibly happy here—from the staff, many of whom have been with Tran from the beginning, to the customers, who accept the close quarters and informal table settings as part of the homey-charm Tran boasts of. How could they not be? Portions are large, prices are reasonable, and the food is the perfect balance of interesting without being cumbersome. Vinh Loi makes its own tofu and most of the mock meats featured in its MSG-free dishes. Entrees are brought out to the table one at a time, as they are made. No heat lamps in this establishment. The menu features over 100 items. But don’t panic. If you don’t know where to start, just ask a fellow patron. When Emmett and I were there one Saturday night, we found several people eager to tell us what their favorite dishes were. Or invite Tran to pick out a meal for you, which he will do so confidently after a few preference questions. You may end up with a dish that isn’t even on the menu, having been created by Tran just that day and never to be served again. The stars of the extensive menu are the soups and the noodle dishes. 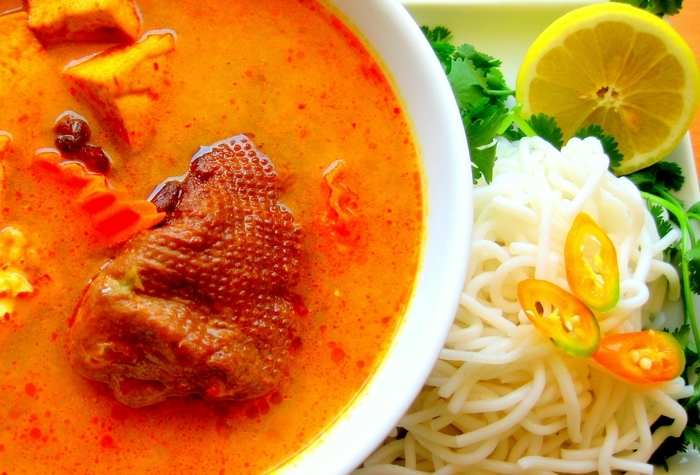 My favorite is the Curry Duck Soup, whose spicy coconut broth teases you with a hint of peanut. The texturally divine Bun Bo Hue soup is the house specialty with a clear broth that allows the rice noodles, lemongrass tofu, shiitake mushroom, and mock chicken and beef to shine. Soups are served with a garnish plate, piled high with fresh, crunchy toppings such as bean sprouts, julienned red and green cabbages, whole mint leaves on the stem, and lime quarters. Noodle dishes with vegetables cooked to tender-crisp perfection are rich and deep in flavor, whether that be with curry, barbecue, or Vinh Loi’s delicate house sauce. You’d be a fool to go to Vinh Loi and not try their flavored tofu. Deep fried with a golden, crisp exterior; light, fluffy interior; and infused flavors such as lemongrass and chili or shiitake mushroom, it is heaven defined. Vinh Loi is the type of place where customers unabashedly crane their necks to see what their neighbors ordered. More often than not, you’ll be offered the chance to taste off their plates, as one table did to us and as we did to another couple. Vinh Loi satisfied not just our taste buds but our home-is-where-the-heart-is attitude as well. “I don’t treat customers like customers,” Tran said. “I treat them like friends.” And who couldn’t use another friend in L.A.? LOCATION: 18625 Sherman Way #101, Reseda; (818) 996-9779; www.vinhloitofu.com. PRICE: Soups and Noodles, $8 to $9.50; Salads, $6.50 to $9.50; Spring rolls, $4.50; Subs, $4.50 to $6.50; Rice dishes, $8 to $9.50; Flavored tofu, $1.25 to $3; Desserts, $2.50 to $4. No alcohol. DETAILS: Open 9 a.m. to 9 p.m. daily. Limited parking in lot, plenty of street parking, free.